Quebec-Grown Garlic – The 2017 available from our online store! 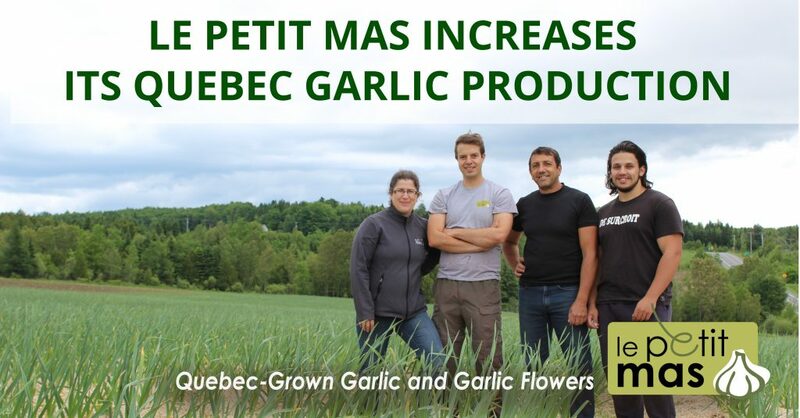 We would like to let you know that the Petit Mas Online Store is open and ready to take your orders of Quebec garlic as of July 25, 2017! The sooner you order your garlic in July and August, the sooner you will receive it in September, and so on for the following months until supplies last. Good news! We will also have an actual store at Le Petit Mas farm (60 Route 251, Martinville, Quebec, Canada). The store will open its doors on September 1st and be open Wednesday to Friday from 9 a.m. to 4:30 p.m. and on Saturdays from 9 a.m. to 11 a.m.
Quebec-grown garlic in BULK is now available for seeds or personal consumption in all garlic varieties, grades and sizes (large, medium, small, Grade 1, Grade 2, Music and Glazed Purple Stripe). When buying garlic in BULK, you will save approximately 5% on your order compared to packaged garlic. The garlic sold in BULK is delivered directly in a box without being packaged in mesh bags. For now, this format is offered only from our online store. Since 1989, we have been growing the Music cultivar, known for its large, strong, juicy and spicy cloves, its excellent shelf-life (8 to 12 months) and exceptional resistance to cold and diseases. In 2012, we received a sample of the Glazed Purple Stripe cultivar from a market gardener. Last year, we began selling this garlic at our online store. Glazed Purple Stripe is a rich and mild garlic. Each bulb has about 10 flat, bronze cloves and a medium shelf-life (6 to 8 months). To find out more, go to our Varieties and Groups of Garlic in Quebec page. 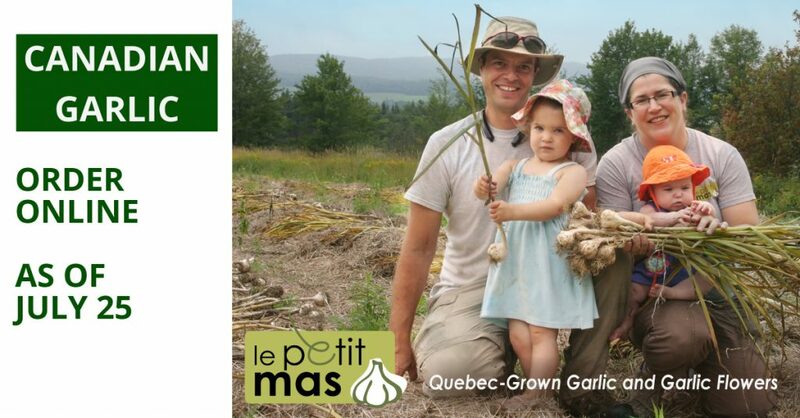 At Le Petit Mas, we carefully sort our Quebec-grown garlic and offer only high-quality garlic (Grade 1) to supermarkets. In order to eliminate food waste, we sell our irregular garlic (Grade 2) through our online store, at food fairs and within the HRI network. In terms of taste, Grade 1 garlic and Grade 2 garlic are equivalent. As for the shelf-life, Grade 1 garlic keeps for longer (8 to 12 months) than Grade 2 garlic (3 to 6 months). Dried garlic is a great addition to salt and pepper to season your meals right at the table! You have any questions? We have the answers! How can I calculate how many kilos of garlic I need to last me throughout the year? What is the difference between large, medium and small size garlic? What is the difference between Grade 1 and Grade 2 garlic? What is the difference between garlic sold in bulk, in a mesh bag or simply as seeds? Is the garlic you sell through your online store certified organic? Is the garlic sold in your online store all grown in the Eastern Townships? Can the garlic you sell be planted? How do I calculate the number of kilos I need for planting? When will I receive my garlic? Can I pick up my order directly at the farm? Can Le Petit Mas products be returned or refunded? I live outside Quebec: can I still order online? Can I order my garlic from the farm store in advance and then pick it up? Can I buy garlic at the farm? When is the farm store open? If you have other questions regarding our products and services, please contact us. We will be happy to answer them! How should I store my canadian garlic? 5- Follow your producer’s advice on how to store garlic: Ultimately, if you buy our garlic, keep it handy on your kitchen counter or in your cupboard at room temperature (around 20°C). Since our garlic has not undergone a dormancy period (which happens when it is kept in the cold), its biological clock has stopped. The germ will grow very slowly inside the bulbs and won’t come out for several months—or even not at all—before the next harvest. 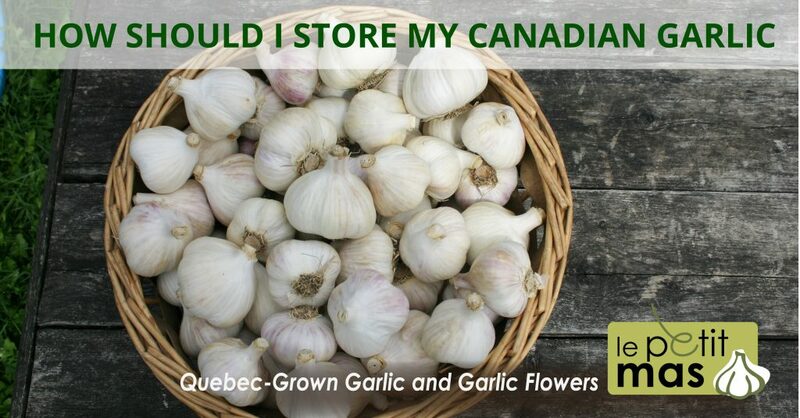 Order your Quebec garlic as of early August and enjoy it throughout the year! While waiting for the next harvest, try our fermented garlic flowers, available year-round in stores. Once opened, the jar keeps in the fridge for over two years!